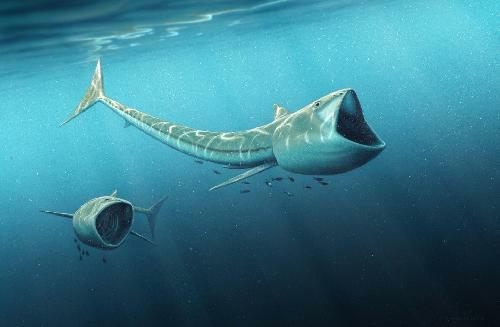 The discovery of a big-mouthed ancient fish is making headlines this week. The fossils of the creature were discovered by a research team that includes international members. The fossils have been dated back to the times of the dinosaurs and it seems they belong to the genus named Rhinconichthys. As Chicago University DePaul paleobiology expert and co-author of the recent study Kenshu Shimada has explained, the newly found fossils are extremely rare. This is the third discovery of the genus, the others being another species found near England and an older Japanese skull. However, the new specimen was found quite far from the United Kingdom and Japan, more precisely in the state of Colorado. As a result, scientists now have three members of the Rhinconichthys genus from three different regions of the world: Europe, Japan and North America. The newest ones were named R. purgatoirensis and R. uyenoi. The results of the study point towards the fact that the genus has emerged from one singular known species, but it has since developed more. All three types of fish belong to the category of suspension feeders, which are fish that eat small organisms suspended in the water, but also the bony fish category since they all have real bones and not just cartilages like most other fish. In spite of their huge mouths, they were meant to catch as much plankton as they could, and not eat other marine animals. The mouths were shaped as immense oars and could open like umbrellas in order to swallow and filter as much plankton as possible in one gulp. Scientists estimate that they used to reach almost 6.5 feet in length. The research was conducted by a diverse team, whose members have various backgrounds. While some came from research centers, universities and museums from both Europe and the United States, others came from agencies run by the state like the Forest Service of the U.S. The species from Colorado was discovered by Bruce A. Schumacher, senior paleontologist at the Forest Service. The next number of the Cretaceous Research journal will contain more information on the new discovery. The discovery of a big-mouthed ancient fish in three different corners of the world is truly astonishing, especially since the species has become extinct a very long time ago.